For those who can not wait for the full plant / stop list for today, I suggest that you cheat and look at https://pkcactus.wordpress.com/2011/03/09/ to read what we saw here 2 years and 2 days ago. There were some differences though. Knowing that there would be no breakfast, we had planned to drive to the Pemex where the OXXO did prepared sandwiches that took care of breakfast, so that we were much earlier on the road and reached the T. alonsoi site earlier, providing time for a more detailed look around. As a result we saw at least half a dozen Mammillaria schiedeana, compared to just one plant in 2011. This time at least three were in flower! Echinocereus pentalophus was in flower but high on the hillside, tricky to photograph but revealing numerous Turbinicarpus alonsoi around them. Clearly out of reach of past collector visits. Long may that last! The other difference was that this time we found two plants in flower, the prettiest one is shown below. The details of today’s stops and plants will have to wait until I get home – sorry. At S3049, along the San Luis de La Paz to Victoria, Guanajuato road: Agave gentryi, Coryphantha erecta, Cylindropuntia sp and Opuntia sp. S3050, farther along the road, for a tree covered with Tillandsia usenoides, a.k.a. Spanish Moss. S3051 along the Xichu to San Anton road: Agave sp, Coryphantha sp., Echeveria xichuensis, Echinocereus pentalophus, Ferocactus histrix, Mammillaria perbella, Mammillaria schiedeana, Opuntia sp., Stenocereus sp. and Yucca sp. 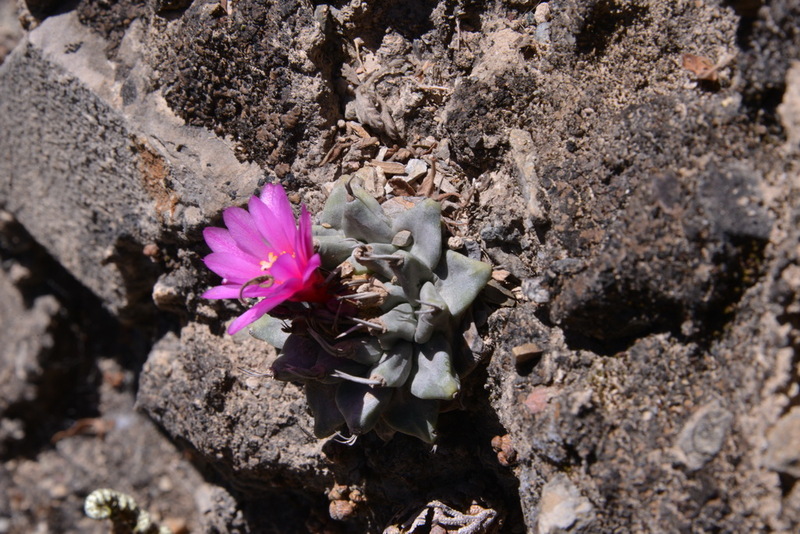 S3052 & S3053, the Turbinicarpus alonsoi canyons, with Agave sp, Echinocereus pentalophus, Lichen, Mammillaria perbella, Mammilloydia candida and Selaginella sp. S3054, on the way home had lichen, Mammillaria muehlenfordtii, Opuntia sp and more trees shrouded in Spanish Moss. 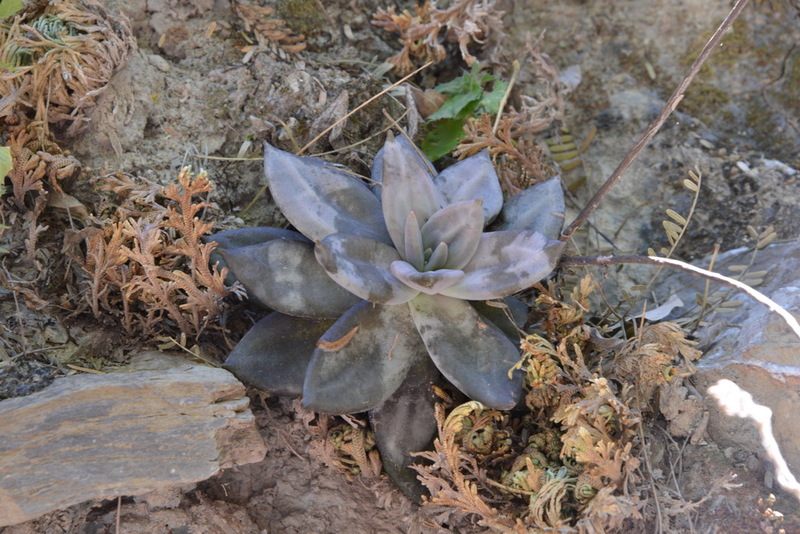 We were supposed to have been in the vicinity of Strombocactus disciformis ssp esperanzae but the spot seemed to be a rock wall right next to a farmhouse with people working near by and children playing in the field. Never mind, we had a number of locations for S. disciformis ssp disciformis.